So cute - I've been teaching some origami folding to my daughters 4th grade class - this one is adorable, and different than the traditional animals. Love it. Those mushrooms made me smile and think of Super Mario Brothers. Perhaps a Nintendo enthusiast would like them? I just printed out the tutorial and am hoping to use them on a talbe design! They're so fun and cute! I love the colors you chose too. ah the fungus among us! I just posted last night about some little glass mushrooms I have been making that look like tiny shiny versions of these origami mushrooms. love the coincidence. Love this! I love orange a lot, too! OMG those are adorable! love it! Very cute indeed. I've been looking at some origami videos on www.happyfolding.com and I'm hooked! Those are so adorb! And I agree with Liv, very Mario-esqe. I think the fact that they exist proves that there is a fairy in your house. Very lucky! what if you attach thumb tacks to the back? they'd make cute little pins! thank you! I just made it with my 4 years old daughter! So cute! These would be great for a woodland party theme! SO CUTE! for my son's 2nd birthday (next feb, haha. ), we're doing Gnome-themed!! i was trying to come up with a not-too-involved craft for the kids. this is PERFECT! great idea! you can make a forest of mushrooms! These are adorable. I made an origami crane mobile once but it's been ages. Definitely going to try these. These are adorable!!! I hate mushrooms as the food, but love them as art! These are SO CUTE! Thanks for the link - guess what I'll be doing today!!! Wow super cute! Thank you! My daughter is going to (in her words) "FREAK OUT ON THOSE MUSHROOMS!" Forget house keeping. I'll be folding today! 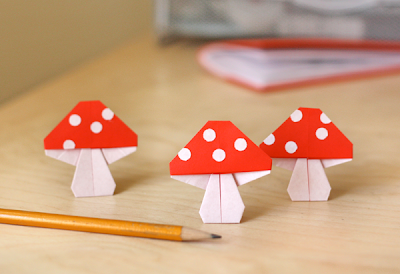 Oh my goodness...I love these little origami mushrooms. I can always count on your blog on inspiring me and educating me on some sort of craft. That's why I nominated your blog to receive the Stylish blog award. I posted a little blurb about it on my blog today. So go ahead Jessica and get your award, you deserve it!!! Thank you for providing me with so much inspiration!!! Hi there, thanks for sharing this great idea. We loved it so much we’ve put a link to it on our blog http://polkadotlighthouse.blogspot.com/2011/04/origami-power.html along with a few other origami-related creations. Thanks again! The mushrooms look fantastic. I've been doing some origami with my youth group kids, and I think they would love the mushrooms. Thanks for the post. Huh, it looks like the page won't load now. This is an old post, so it's possible the instructions I linked to have been removed since then.